There was always the ‘tuks’ and then came the metered taxis, which made life a lot easier for those depending on them for transport as it finally meant a standard fee was charged. Then we were hit with PickMe, a service we cannot seem to live without, much due to the level of convenience it offers. Before PickMe came to being, the concept of getting a taxi to your doorstep was available and all it took was a call and an approximate 30 minutes of waiting time. The service that disrupted the nation’s taxi industry leaped to reap the benefits on the increasing ownership and usage of smartphones, making a taxi available at your doorstep in just a click, that too within minutes. What more could we busy bees have asked for! Founded in March 2015, the service has grown from strength to strength in terms of both capacity and service. 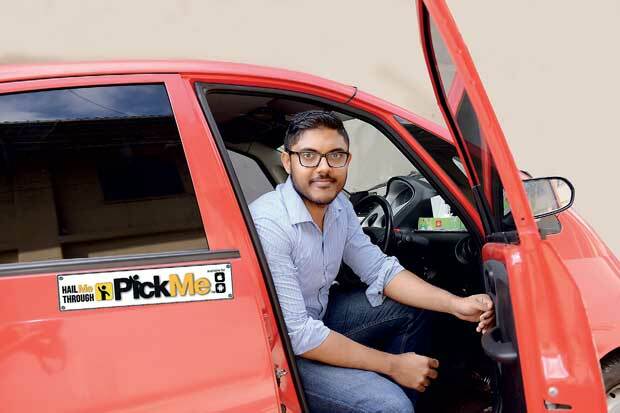 What started off as a taxi service that was dominant in Colombo (mostly three-wheels), today has expanded to an islandwide network and includes just about any vehicle, even a boat in case of floods. In the words of PickMe Co-Founder and CEO Jiffry Zulfer, the facility is a technology-backed service that ensures and strives to offer passengers a safe, comfortable and a hassle-free journey. “The PickMe app essentially connects the passenger with the closest taxi. The inbuilt features and processes ensure that the passenger has a good experience while reaching their destination,” explained Zulfer. Not just one, but PickMe solves quite a few problems that were overlooked by the industry stakeholders for quite some time. The product irons out the issues faced by the country’s taxi industry, such as inefficient usage of vehicles, lack of reliability, lack of availability, inconvenience and safety concerns, thus extends an array of solutions to drivers, passengers and other stakeholders in the taxi industry. “Our aim is to ensure that a passenger is able to get a vehicle at any time of the day from any location, by a simple click of a button,” said Zulfer. He shared that the bigger plan is to contribute in making the nation’s transport system more efficient in terms of better utilization of vehicles on the road as it would have a positive impact on both, the economy and environment. The platform has helped remove inefficiencies in the taxi industry while accelerating the growth in the industry. The technology has also improved the social status attached to a person engaged in the driving profession, while enhancing their living standards. He added that from the consumer side, due to the convenience factor, observed is a trend in customers opting to use a taxi rather than taking their own vehicles out, eliminating traffic, parking issues, safety concerns and also opportunity cost. The thought process behind PickMe was formed much before it started. Around 2011, the app-based taxi-hailing technology in the US, Uber that was gathering momentum and traction caught the interest of Zulfer. Looking at it from different perspectives, he was determined to not just build the same but a technology that would suit and cater to the needs of the local taxi industry. Zulfer stated that the team was confident the product would be accepted by Sri Lankan passengers and the driver community and felt that the timing was just perfect. “We wanted local talent to build the technology and operate the company. Once the recruitment was done and the technology perfected, we launched our services as private beta. “I believe for a start-up company, recruitment is critical; it is essential that the key management personnel are passionate about the business. I think this helped us convert the idea into a product that was immediately accepted by the market within a very short period of time,” he explained. While wanting a product that is innovative and capable of solving the many shortcomings witnessed in the industry, Zulfer stressed the team did not want the app to be a “copycat model”, replicating the product seen in the US or elsewhere. And true enough, there are many features built into the app that was designed specifically for the Sri Lankan taxi industry. For instance, the Drivers app is in the languages of Sinhala, Tamil and English and is colour coded to suit the literacy level of the driver. The pricing is based on a ‘KM + Waiting Cost’, which is a unique pricing model compared to other taxi-hailing apps found elsewhere. The Drivers app is also equipped with an inbuilt GPS meter, replacing the ‘odometer’, which the Sri Lankan passengers were used to, despite it having many shortcomings. Securing seed capital is a common challenge faced by start-ups but not for PickMe. Zulfer stated that securing seed capital was “not a big problem” but getting the right investors in was priority. The initial investors are said to have brought in more than just capital to the business. They not only extended a free hand in running the operations and encouraged the team’s innovative spirits but were willing to provide the overall guidance when required. “I was fortunate to have a set of investors that understood the technology and was passionate about the business,” said Zulfer. The path to victory is certainly not smooth and PickMe has had its own share of challenges in its journey. Even prior to the launch, the product had to pass many stumbling blocks that included technology, hardware and human resource. However, due to commitment and dedication from the key management team, a good proportion of the bumps were eased out but it was not without employing creative thinking over than traditional methods. PickMe has certainly picked up pace and is on a fast and furious drive towards reaching the next stage. Coming on board the platform on a daily basis are new drivers and passengers. The current plan is to get to a higher level without compromising quality. With regard to what is ahead, Zulfer is not so keen on getting into the specifics just yet. However, he assures innovations will continue and new features are in the midst of being incorporated into the app. Sometime next year both the consumer and transport sector itself would witness an upgrade via PickMe. Zulfer expressed confidence that the next 20 years of business will be defined by tech-enabled businesses that would evolve to disrupt the status quo. This will ultimately be bought by a big company like Uber.